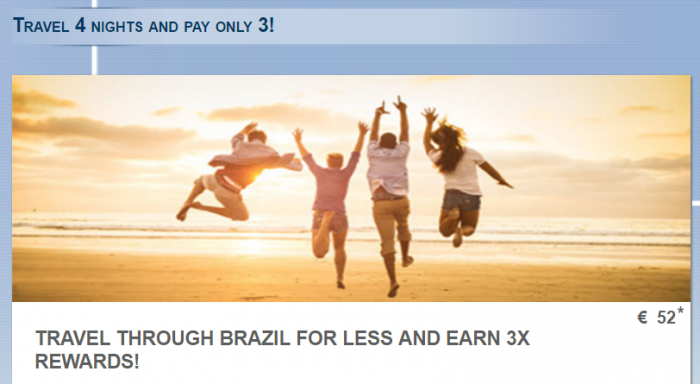 Le Club AccorHotels has launched fourth night fee rate plan for stays in Brazil that also comes with triple points. The offer is valid for stays consumed between January 1 – February 28, 2017, that are booked January 1 – 31. Note that you must register for this offer and booked the specific fourth night free rate plan to earn the bonus points. Nothing beats earning triple points as long as the rate plan is not inflated compared to other ones that may be available for the duration of the stay. 1. The Le Club AccorHotels general terms and conditions apply to the 4-night Travel offer and pay only 3! And to enjoy it must be associated with Le Club AccorHotels. 2. This offer allows Le Club AccorHotels associates, regardless of their status, to enjoy the bonus points accumulation x3 for a stay at one of the hotels participating in the Le Club AccorHotels Loyalty Program. 3. This offer is valid for the lodging of an associate from 01/01/2017 until 02/28/2017 in one of the participating hotels and booked between 01/01/2017 and 01/31/2017. 4. The lodging must have a minimum of 4 night (s). 5. Any consecutive accommodations (same day check-in and check-in) at the same hotel will be considered as a single stay. This unique lodging will be valid once for the offer 4 nights travel and pay only 3 !. 7. To take advantage of this offer, your reservation must be made on AccorHotels.com, websites and applications of participating brands and Call Centers AccorHotels. Any other booking channels will not be valid for this offer. 8. Please indicate your Le Club AccorHotels loyalty card number at the time of booking and present your card at the hotel reception upon check-in. 9. Le Club AccorHotels bonus points are credited to the member’s account within 10 days of the end of your stay. If the hosting meets the terms and conditions of multiple offers, only the points of the most generous offer (ie that allows you to earn more points) will be credited to your account. 11. Any lodging paid in part or in part with Le Club AccorHotels points or with one or more vouchers will not be eligible to benefit from this offer and for offers that require multiple lodging for points accrual. 12. Please quote the following reference: 48655 in all communications with AccorHotels customer service related to this offer.